From the random scans file: a copy of the quarterly US magazine HORROR FAN from back in 1989. I found this recently for a pound and decided to pick it up as an example of the title. Incidentally, the Englund take on PHANTOM OF THE OPERA has recently been released on shiny disc. I grabbed a copy in the Fopp Halloween promotion last year... but I've yet to find the time to see it. I'm not expecting great things. 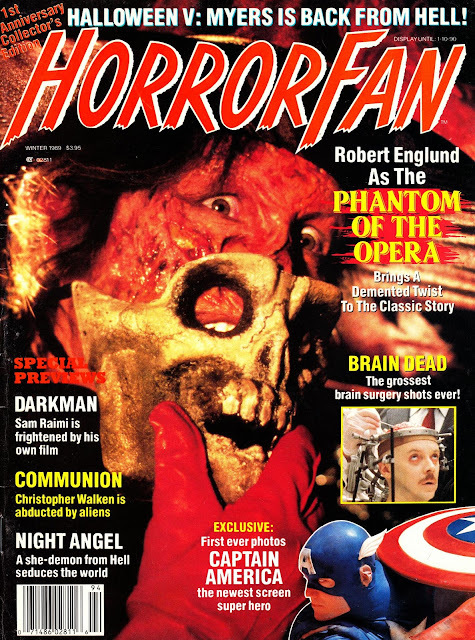 Its funny how the editor managed to shoehorn in the (severely underrated) CAPTAIN AMERICA movie into what is obviously a horror mag. US audiences had quite a wait to see this post-Cannon clunker. From December 1979 (but dated January 1980): Are you ready for the Eighties? 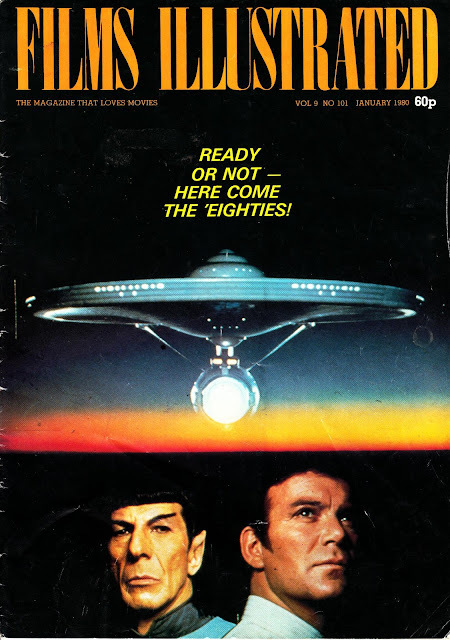 Shatner and Nimoy usher in the new decade with a familiar (but, nonetheless, still spectacular pre-Photoshop) STAR TREK: THE MOTION PICTURE publicity still very effectively used as the cover of UK magazine FILMS ILLUSTRATED (volume 9, issue 101). TMP was, of course, along with Disney's THE BLACK HOLE, the must-see Star Age movie at the Christmas 1979 Box Office. From the Spring of 1995: my only surviving copy of the fanzine CHILDREN OF A FAR GREATER GOD, dedicated to guaranteed late-night telly guilty pleasure (the visit to 'Wanker County' is the stuff of legend) MARRIED WITH CHILDREN. Published in the UK, and sold through mail order (I can't for the life of me recall how I found out about it in the first place... maybe an advert in TV ZONE or AMERICANA), this was an A5 affair with colour paper covers. 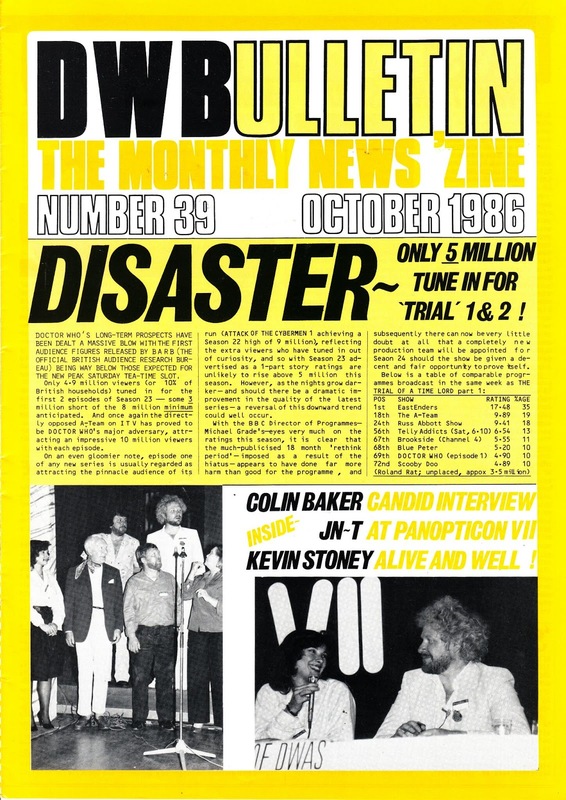 The contents were a mix of new articles (one issue, although I don't think it's this one, had an account of attending the recording of an episode as an audience member) and reproduced newspaper and magazine articles devoted to the show (vital in the pre-web age). I'm not sure how long this ran but if anyone has any other issues they are happy to scan, I'll happily post them here on STARLOGGED. 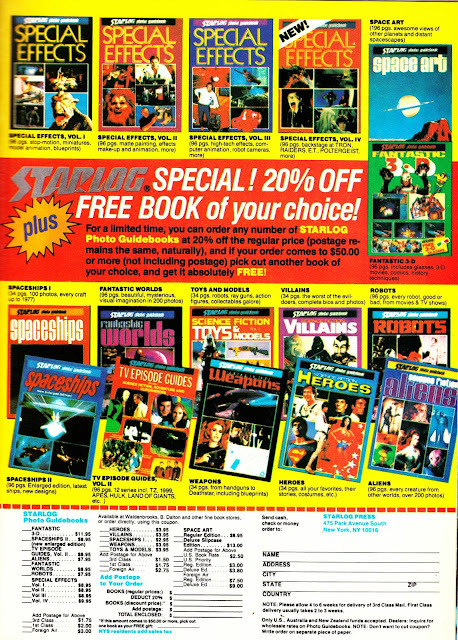 From 1987: A STARLOG MAGAZINE house ad for their spin-off book series. These had been in print for the best part of a decade and some of them were really starting to show their age at this point (only the SFX books were still an ongoing series) so it looks like the publisher was lumbered with overstocks that they were keen (desperate?) to liquidate. The first volume of the TV EPISODE GUIDES series (which never reached volume 3) was an early sell out that was never reprinted. From February 1978: Here's the sort of cover juxtaposition that probably makes Lucasfilm cringe... the UK's FILMS AND FILMING magazine marks the belated British release of STAR WARS. The SW still looks to be one of the more unusual ones to me... it doesn't look as familiar as some of the publicity stills that appeared literally everywhere. 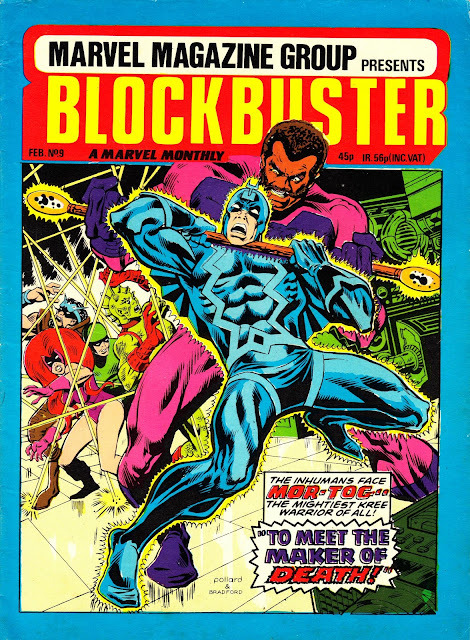 From February 1982: the ninth and final issue of MARVEL UK's less-than-memorable BLOCKBUSTER. 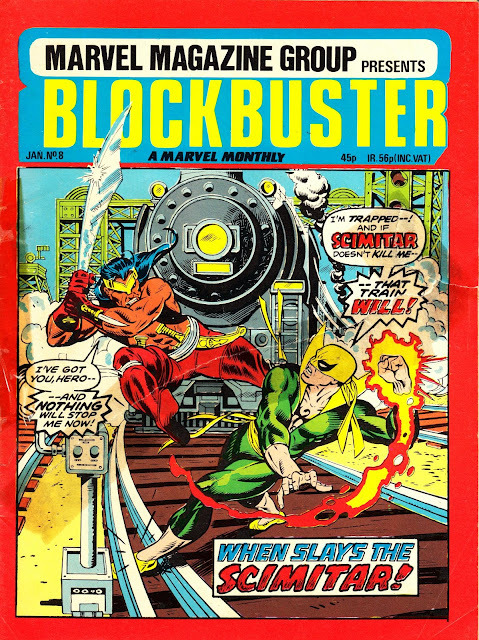 The blink-and-you-missed-it monthly featured a stable line-up of Omega, Iron Fist and the Inhumans throughout the brief run. It merged with RAMPAGE the following month. From March 1993: An Innovation Comics house ad hailing the launch of their impressive (but ultimately short-lived... the company went bust at the end of the year, sinking several pretty good media tie-ins) BEAUTY AND THE BEAST monthly comic book, based on the defunct CBS drama (shown erratically by ITV in the UK) with a strong cult (and mostly female) following. From thirty (!) 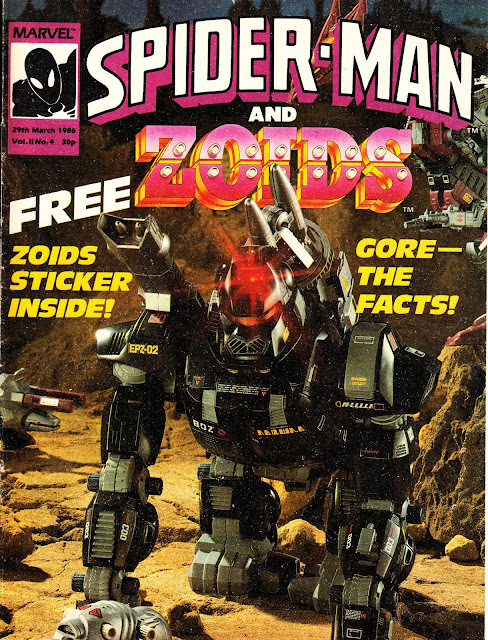 years ago this month: the first four issues (all on sale in March 1986) of Marvel London's SPIDER-MAN AND ZOIDS weekly. 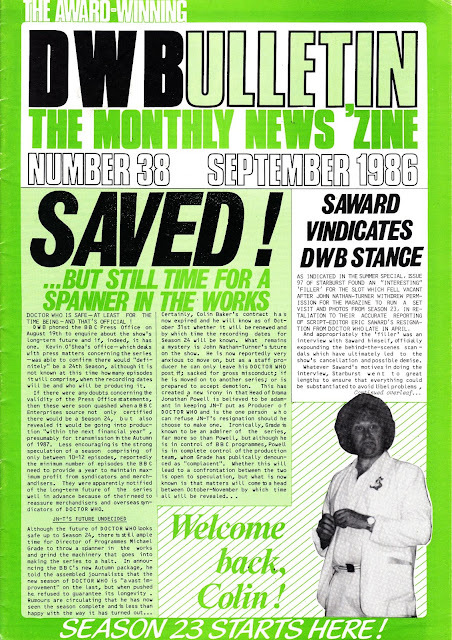 The previous year had not been kind to the web-slinger's long-running weekly (once the flagship of the British line but now looking distinctly unloved). Distribution had got so bad that copies seldom surfaced in any newsagent and the only way to be sure of a copy was to place a special order. Several format changes (tweaking page counts, paper stock and colour pages) had taken place in quick succession. 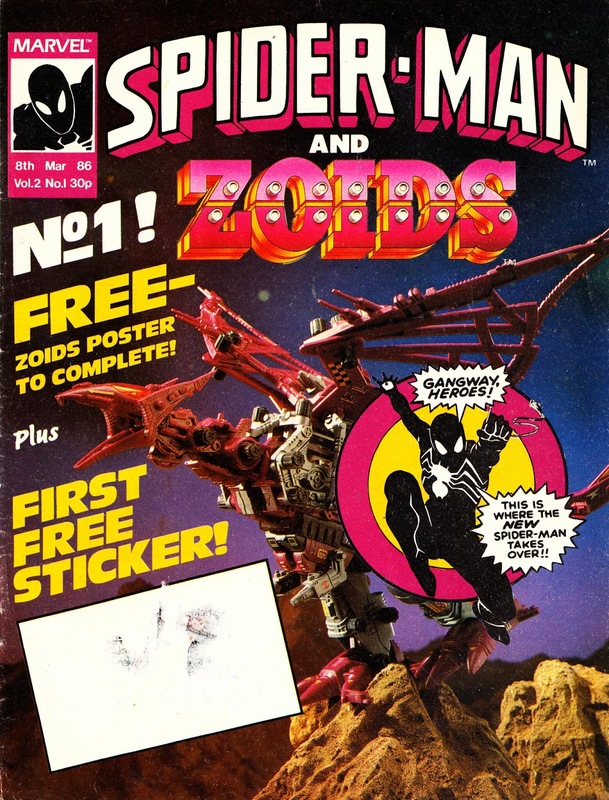 A radical relaunch as THE SPIDER-MAN COMIC (latterly SPIDEY COMIC, a spec title that Dez Skinn had mocked up a few years earlier as an entry level book for younger readers) pitched the weekly at a younger audience and 'encouraged' established readers to shift their loyalties to the new SECRET WARS launch. 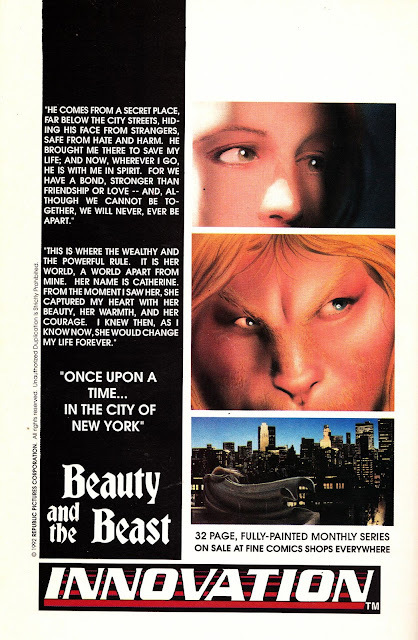 The reboots were not a success and the 666th issue, published in early December 1985, was the last. But that finale did promise a reboot in the new year. And this was it. The Spider-man stories returned to the present continuity (or a convoluted British version thereof) and an older audience. And they were packaged with more commercially appealing fare which satisfied the current corporate mantra that a toy tie-in was essential for success. And two would be even better. 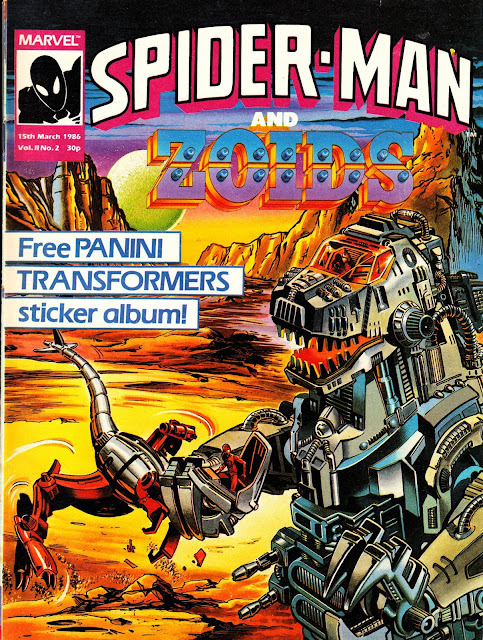 Marvel's first encounters with the Zoids had been in two strip inserts across the range (see posts previous) which must have been well enough received for Tomy and Marvel to book them in for a finite regular booking in the (increasingly packed) pages of Secret Wars. Clearly a success, the UK originated strip was shuffled again to become a regular herein. Make no mistake, despite the masthead, this bunch of warring machines were the main attraction herein. The last issue of the original run teased this return to form and promised that the Fantastic Four would take the third slot in this all-colour 24-pager (the so called "Get Along Gang" format). However, Marvel encountered industry resistance from a newstrade resistant to superhero fare. So the back-up strip (the first of a succession) was allocated to SECTAURS, another American toy line (and, very briefly, a TV animation) which combined action figures with glove puppets. 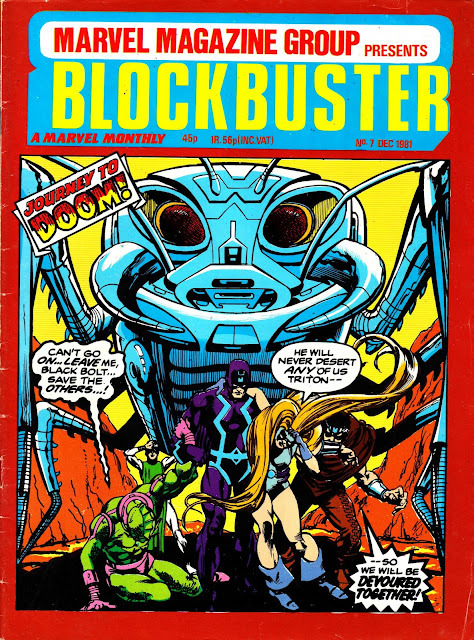 The reprint hailed, logically enough, from the first US issue. Over the next few weeks STARLOGGED will chart all 51 (yup... this wasn't a rousing success) issues of this interesting little run. Issue one came with a Zoids photo-poster (basically a photo of the toys) with spaces for stickers. 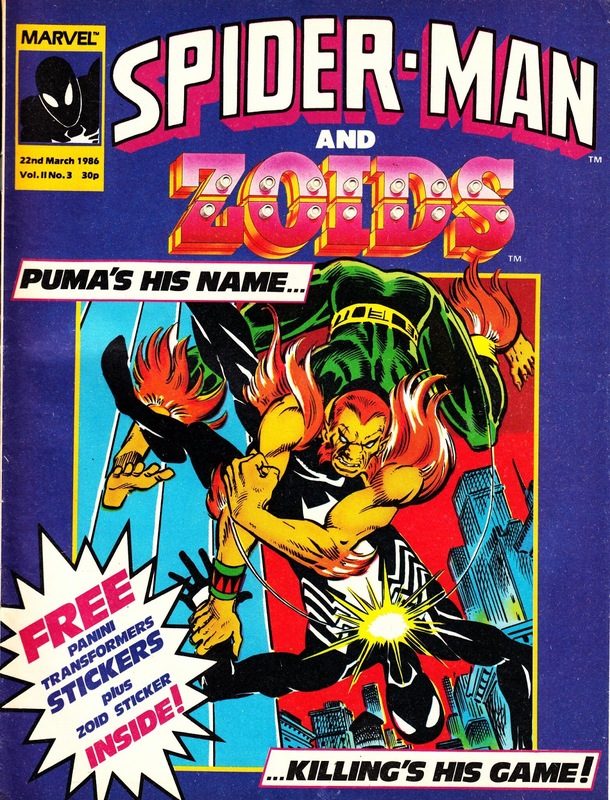 The first sticker was cover-mounted (lost from this copy) with more stickers loosely inserted in the following issues starting with week three. The second issue was bagged with a TRANSFORMERS sticker album and starter stickers (that tried and tested wheeze) adapted from the cartoon series. The third issue featured more stickers to seal the deal. From May 1987: another issue (number 43) of DOCTOR WHO BULLETIN (aka DWB). Unfortunately the run I acquired skipped a couple of issues but it looks like the mag took a brief hiatus and then returned with this restyled (and much neater) cover layout. Who could resist a centre spread tease like that? From February 1977: the first issue (or "voyage") of the ongoing (rare for the genre) STAR TREK POSTER MAGAZINE aka GIANT POSTER BOOK. 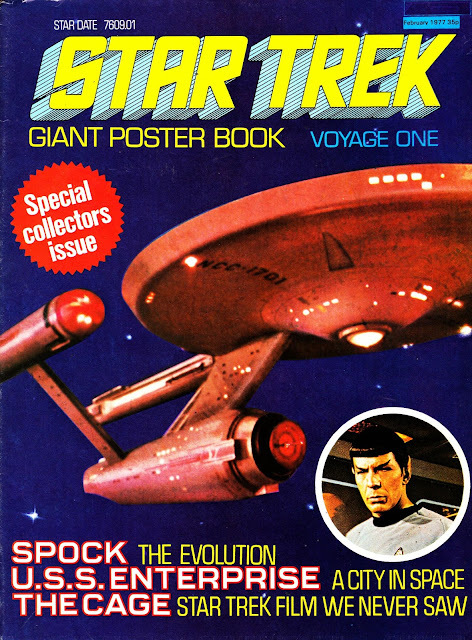 This followed the tried and tested poster mag format but whilst most were one-shots or, at best, only published for a few months, this notched up an impressive seventeen regular issues and a special devoted to STAR TREK: THE MOTION PICTURE. The last regular US issue was dated April 1978 with the special appearing more than a year later to coincide with the film's December '79 release. Not bad for a magazine devoted to a show that debuted eleven years earlier and failed to see out the sixties. This is a British edition that, if the cover date is to be believed, hit UK stores almost six months after the American edition (which was dated September '76: the ship's tenth anniversary). Its not clear whether the UK received all seventeen issues. Most of the Trek movies had poster magazine tie ins of some description although not all followed this format. Visual Imagination enjoyed considerable success with a long-running Next Generation version. Titan Magazines clearly hoped their Deep Space Nine equivalent would fare equally well. It didn't. 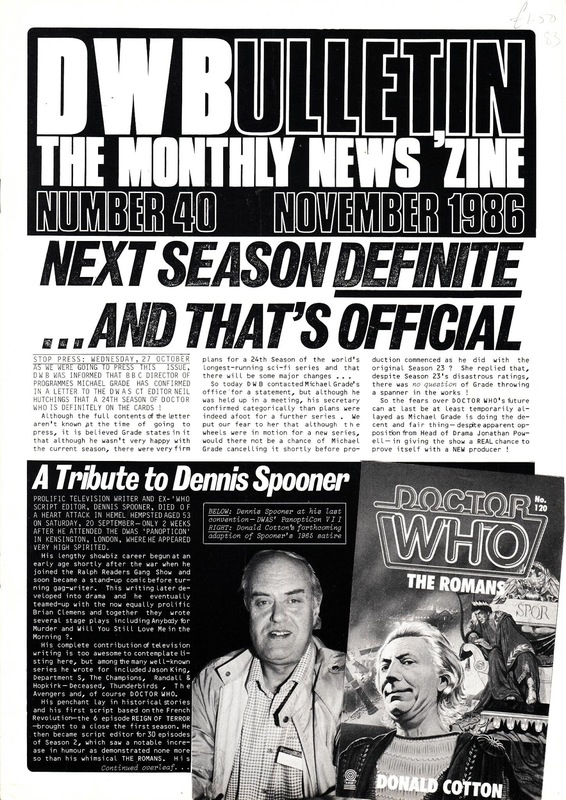 From November 1986: a rare bit of good news during a bleak period in the history of WHO. DOCTOR WHO BULLETIN 40 reports that, despite soft ratings (see previous posts), the show was being renewed for a 24th season. From January 1982: a pretty beat up copy of the penultimate issue of Marvel UK's decidedly brief BLOCKBUSTER. The line-up was, as per usual, Iron Fist, the Inhumans and Omega the Unknown. From October 1986: How times change... 5 million punters might have been a disaster for the new season debut back in 1986 but, in our new fangled modern world, most UK broadcasters would be quite chuffed with a similar audience. To be honest, I remember seeing the opening installments of the TRIAL OF A TIMELORD season and being distinctly underwhelmed. Not only was the whole idea of a sprawling 14 episode story arc flawed (and poorly executed) but JN-T's legendary showmanship seemed to have abandoned him. With the exception of the impressive motion-controlled miniature to open the story, there was little in the way of spectacle. Had he had served up a REMEMBERANCE OF THE DALEKS, he could have generated some buzz around the show again. The slump also, of course, played into DWB's narrative that the current production team (read: the producer) needed the boot in order to inject fresh blood. What only became clear later was that JN-T was one of the few people inside the Corporation really to trying to keep the show in business at all. And just look at some of the stellar ratings that some other regular shows were getting: over 17 million for EASTENDERS (although that almost certainly consolidated the Sunday afternoon omnibus repeat as well... and these were the days before Sunday opening gave millions the opportunity to dodge it), 10 million for DW's arch Saturday evening rivals THE A-TEAM. And even 4 million plus slumping down after school (or work if you'd bunked off exceptionally early) to see BLUE PETER. 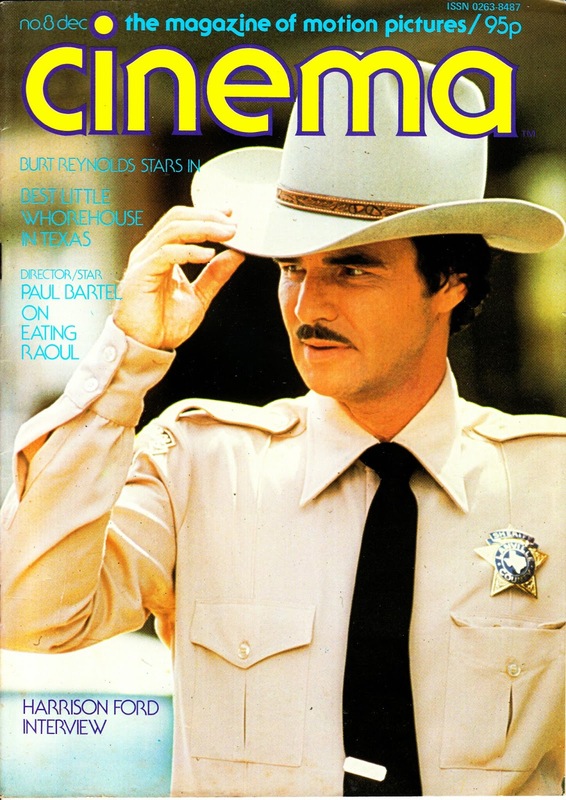 From December 1982: the 8th issue of Marvel UK's long forgotten venture into movie magazines: the short-lived CINEMA. From September 1986: the next in my acquired run of DOCTOR WHO BULLETIN (aka DWB) back issues: number 38. And, it has to be said, another vicious choice of colour for the cover. It's one thing to stand out on the racks (the fanzine's SUN-alike style, along with strong news coverage during a difficult time for the programme, was seeing shop sales rising with every issue... something that BBC Enterprises and Marvel London couldn't help but note) but another to be virtually unreadable. 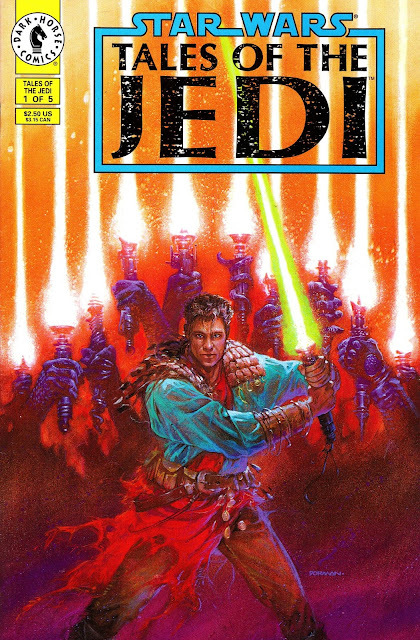 From October 1993: another launch in the burgeoning line of STAR WARS comic books from Dark Horse: TALES OF THE JEDI. 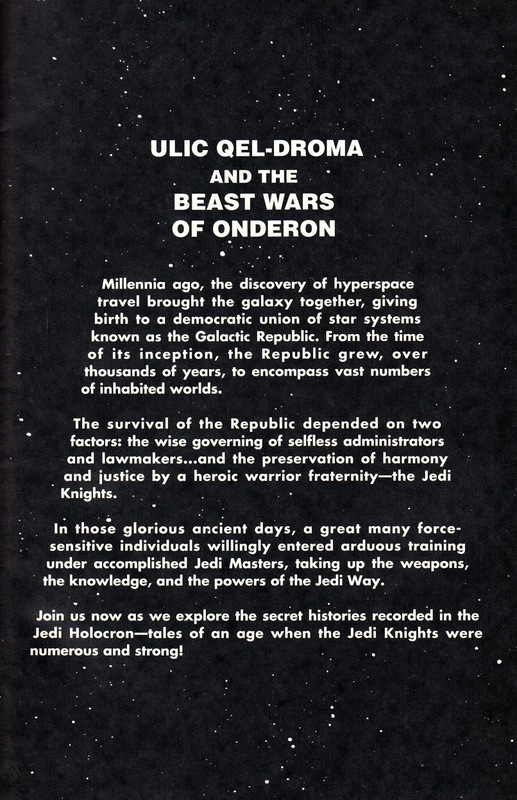 This was another landmark series because, for the first time, it demonstrated that Star Wars adventures didn't have to be contemporaneous to the film series but could plunder the whole rich history of the expanded universe and feature none of the screen-familiar characters. That, of course, gave the creative teams free reign to really have some fun with concepts and scenarios only hinted at to date... without falling foul of the continuity police. The stories appearing here took place 4,000 years before the first Death Star went bang. There was also a sourcebook from West End Games that filled in more of the backstory. This also demonstrated Dark Horse's willingness to push the envelope in terms of expanding the scope of the saga. A policy that would go on to help them build a bewildering diverse range of SW titles and pave the way for other parts of the Lucasfilm merchandising juggernaut to similarly leave the confines of the films behind. It may have even have helped convince Lucas that audiences didn't need all the familiar faces in order to turn out in droves to see a new Star Wars flick. Although I bought this first issue at the time, I wasn't terribly interested in mining the ancient history of a fictional realm and I didn't bother to pick up another issue. 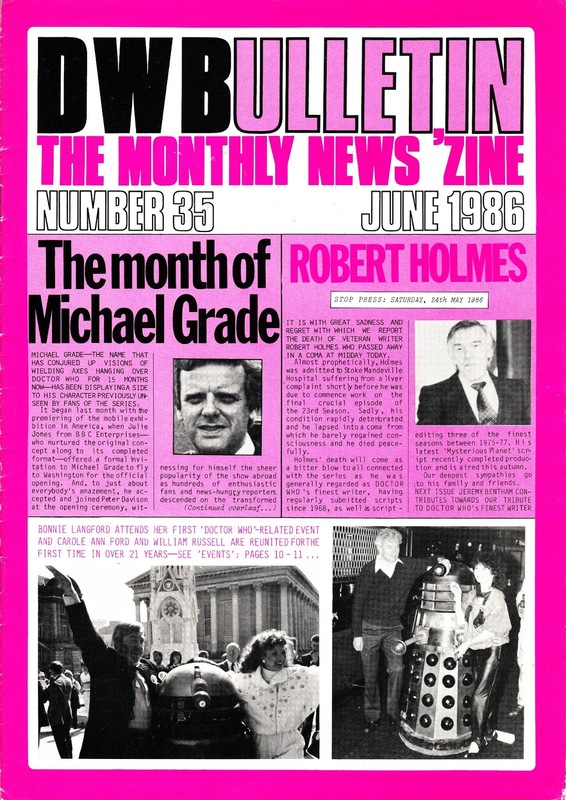 From June 1986: more from the tumultuous time in WHO's history... issue 35 of DOCTOR WHO BULLETIN. The death of Robert Holmes not only deprived the show of one of its most highly regarded writers (although his recent track record had been more shaky) but also proved to be the final straw for script editor Eric Saward (who, as previously noted, bailed in spectacular fashion shortly thereafter). And no surprise that Michael Grade would accept a BBC ENTERPRISES bankrolled trip to the States for a bit of promotional work... and no doubt some sightseeing as well. From 1986: the cover of the programme for the 1986 BIRMINGHAM COMIC ART SHOW. I wasn't at the event, held 31 May and 1 June (indeed it would be way over a decade longer before I visited Brun for the first time) and picked this A5 black & white booklet up, for a few pennies, much more recently. 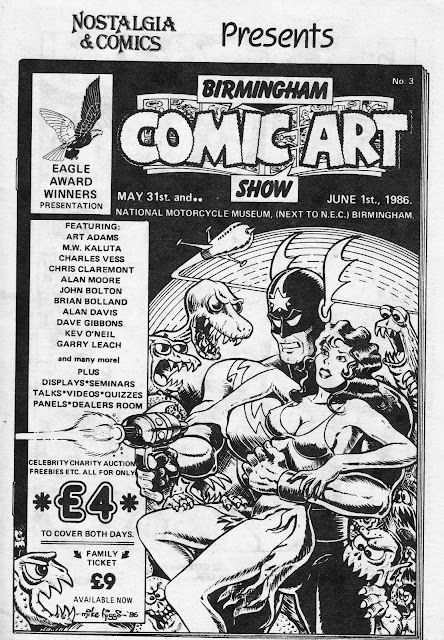 Cover art, which (I think) also graced the advertising for the event (because the whole thing looks familiar from fanzine ads from the time) by Mike Higgs. Check out the stellar line-up of creative types who attended...and the low (it feels today) admission price. For context a UK weekly was selling for around 35p and an imported US monthly for under a pound. Give or take. From December1981: the seventh issue of MARVEL UK's ignored-then-and-now BLOCKBUSTER Monthly, unsung home of the Inhuman, Iron Fist and Omega the (completely) Unknown. A stellar line-up to be sure. 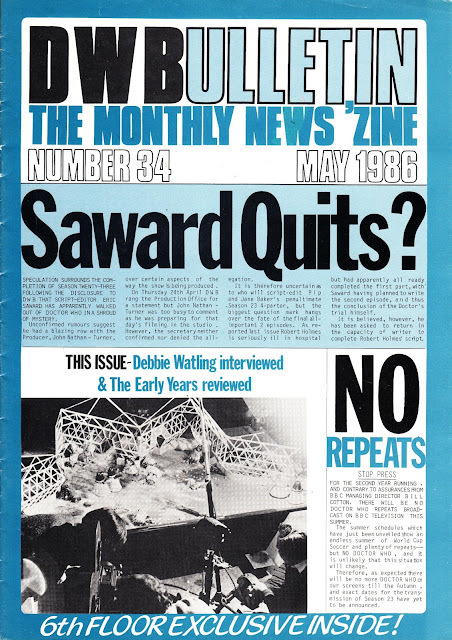 From May 1986: Indeed Saward does. Although his blistering, wash-your-dirty-laundry in public, attack on his ex-employer was saved for the pages of Starburst magazine (a story that was subsequently picked up by the national press and hammered a few more nails into the show's coffin). Its not as if he bowed out on a high: the show had suffered from a run of sub-par stories (although Resurrection of the Daleks was a cracker) which ropey production values couldn't camouflage. But Eric will be reassured to know that it did get even worse after he went... before a drastic swing back into quality as the BBC was preparing to shutter the series.